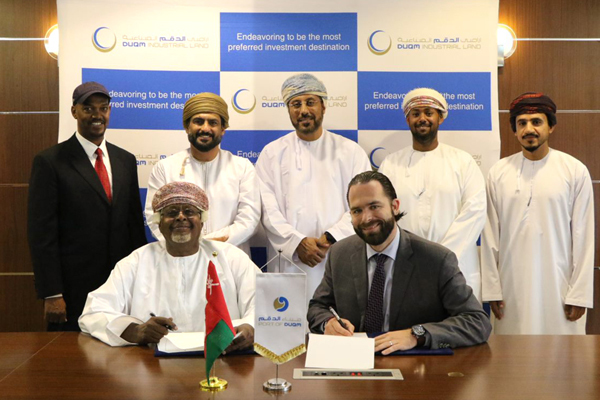 Duqm Industrial Land Company (DILC), a subsidiary of Port of Duqm Company, has been granted the usufruct right over 2,000 hectares of industrial land for over 35 years by the Oman Government. Under the arrangement it has the exclusive rights to develop, lease, manage, operate and market the industrial land located inside of the Special Economic Zone of Duqm. The industrial land will be largely used by petrochemical, medium heavy and heavy industrial activities, said a stastement from the company. DILC is determined to facilitate the diversification of Oman’s economy. It is currently in the phase of developing and handing over long-term lease agreements to tenants. DILC is developing as an integrated manufacturing industrial area that will utilize the multiple natural resources available in the al Wusta governorate. DILC recently signed two 25 years lease agreements with respectively Al Hana Engineering and Mohammed Jama Esmail Trading. This event was chaired by Reggy Vermeulen, CEO of Port of Duqm. The total industrial land area covering both the agreements was about 40000 sq m. Both companies will establish their fabrication units to perform predominantly steel fabrication activities. Mohammed Basheer, chairman Al Hana Engineering Industries stated that we foresee huge business potential caused by the various projects being developed in Duqm, and this will help us to bring real value for our investment there. He thanked Hilal Al Balushi, business development manager at PDC and his team and mentioned that, DILC is rapidly confirming its reputation of providing quality support and prompt service and we look forward to enjoy such service further post signing this agreement until the actual work commencement and commissioning of the facility. DILC provided us with levelled industrial land which is strategically located within proximity of the Port and this will help us perform our activities more efficiently. This was possible only by the efficient and committed involvement of the entire DILC technical and commercial team stated Mohammed Jama Bait Ishaq, CEO - Mohammed Jama Esmail Trading MJET. He also mentioned that, ‘MJET’s project in Duqm will generate 30 job opportunities for Omani within 2019 and this number is expected to grow in the future’.